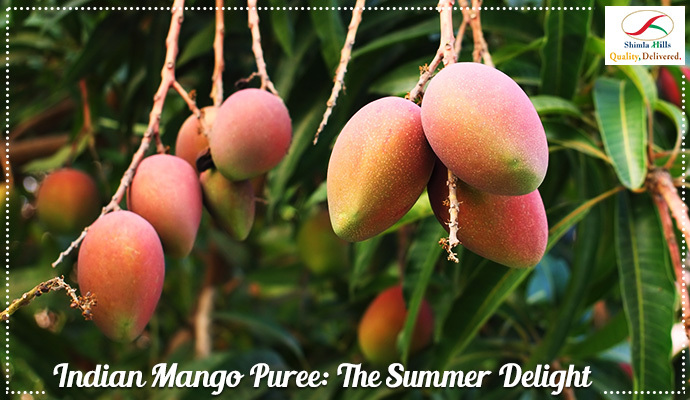 Summer is here, and so is the king of fruits – Mango. Among the various way to consume a mango, its puree is one of the major ingredients that goes into the making of juices, nectars, jams, fruit cheese, beverages, puddings and bakery fillings, fruit meals for children, ice-creams and yogurt. Shimla Hills, one of the leading and trusted mango puree suppliers, harvest mangoes when they attain appropriate ripeness. They are then processed following all GMP and hygiene standards. This ensures that the pulp is strained free from peels, stones specks, other coarse parts of mango fruit and other substances. The Indian Mango Puree offered by Shimla Hills is further categorized into Alphonso, Kesar and Raspuri and Totapuri Mango puree. The Shimla Hills quality team ensures that the mango puree meets the desired customer specifications. Once the team is fully assured about the same, the puree is then transferred into special packaging under absolutely sterile environment. The puree is packed in aseptic bags and then in drums to preserve its natural aroma and characteristic rich, deep yellow color. Apart from being a leading manufacturer and exporter of mango puree, Shimla Hills is also a trusted supplier of IQF Mango dices/slices, Mango Pulp, Juice Concentrate, and various other agro-products. To get your hands on premium quality Indian Mango Puree, book your order NOW!